A diverting history of the national anthem—ironic, anecdotal, and blessed with a dry humor—from New York Times reporter Molotsky. Bellicose and bumptious, that martial tune “The Star-Spangled Banner” is inescapable: sporting events, civic ceremonies, holidays, whatever—the anthem gets trotted out and the words butchered by an enthusiastic vox populi (not to mention by Robert Goulet and José Feliciano during prime-time television). But as a national anthem it’s only 70 years old. And its history? Wasn’t the flag sewn by Betsy Ross and the song written by Francis Scott Key after a successful Revolutionary War battle? No—and Molotsky entertainingly sets readers straight. Mary Pickersgill sewed the flag (Betsy Ross may well be a national figment) that flew over Fort McHenry during the War of 1812, in a battle the successfully defended Baltimore. Baltimore? Yes, a far more important burg 200 years ago than provincial Washington (which had already been torched by British troops anyway). The author draws a terrific thumbnail sketch of the War of 1812—a much-misunderstood event, particularly in American history textbooks (which often conveniently forget the US invasion of Canada). He also introduces the major characters involved in the battles, the flag-making, and the songs, with lots of caustic asides (Key, for example, was a slave owner who felt perfectly comfortable rhapsodizing on “the land of the free”). 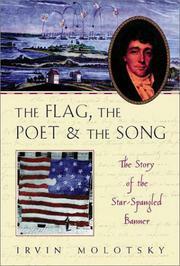 He even dissects the words of the anthem for us, so that readers will know what “the rockets’ red glare” refers to. There is a rather long section on flag-burning and the First Amendment, but Molotsky keeps things lively by skewering any pompous windbaggery (such as that displayed by Senator Orrin Hatch and his self-serving, patriotic grandstanding) on the issue. A fascinating slice of America’s past, wonderfully told. It might even inspire sports fans to get the words right.